Hyundai Motor India Ltd (HMIL), India’s popular car manufacturing company has today officially unveiled the design renderings of their upcoming new SUV dubbed as Hyundai Creta. Hyundai ix25, popular compact SUV in Chinese market is now known as Hyundai Creta in the rest of the world, the company made an official announcement on their new Creta nameplate. 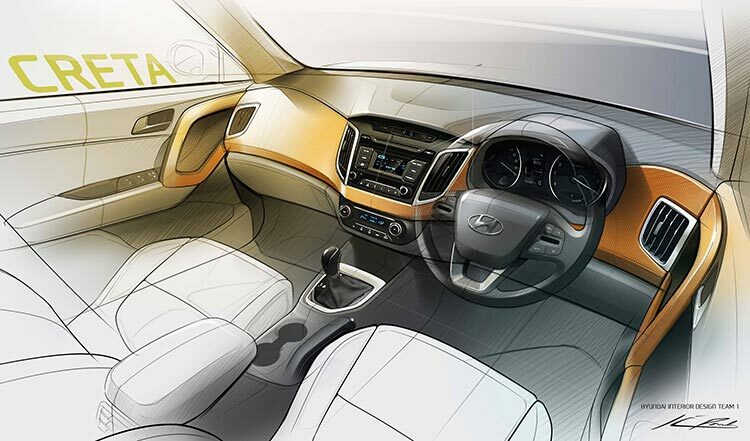 Based on Hyundai Motor’s evolved design philosophy, Hyundai Creta design comes with a premium look. A special note on car‘s bold front, voluminous side, sporty rear that shapes up the premium SUV design. A singular hexagonal radiator grille, sleek profile and a stable stance comes together to the bold and modern looks of Hyundai Creta. The hidden A-pillar was applied to grant a unique and dynamic image as well as more open and airy cabin. The new Hyundai Creta is based on Hyundai’s revolutionary next-gen Fluidic Sculpture 2.0 (FS2.0) design philosophy. The Fluidic Sculpture 2.0 Design philosophy takes forward the highly acclaimed fluidic design theme in a refined manner providing a modern as well as premium touch. Fluidic Sculpture 2.0 has achieved an evolution in design by adding class as well as greater value to its stylish and powerful posture.